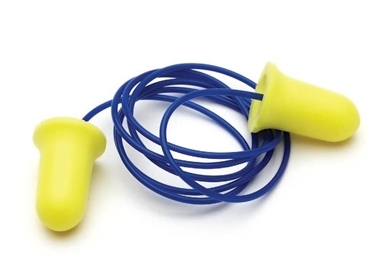 Metal detectable ProPlug Bell disposable ear plugs, available from Prochoice Safety Gear offer a high level of hearing protection for workers in busy industrial environments. The ProPlug Bell range is approved to AS/NZS 1270:2002, and offers protection against noise levels to 110dB(A), making them suitable for general and industrial use, and ideal for food processing applications. Some of the application areas include mining, construction, fabrication, engineering, manufacturing, automotive, wood working, assembly line production and cleaning. ProPlug Bell metal detectable corded ear plugs offer maximum protection in busy industrial work environments where the threat of any contamination is unacceptable, and eliminate any damage to sensitive production lines by the accidental introduction of ear plugs. Hearing loss among workers caused by exposure to industrial noise is one of the most widespread, yet preventable workplace injuries. Easy prevention measures including hearing protection devices help avert permanent and debilitating hearing loss.